Werner's Cairns blog: Australian Federal Labor Party machinations. Australian Federal Labor Party machinations. Despite the fact that many Australians disliked deposed former Prime Minister Kevin Rudd and wanted to get rid of him, many feel sorry for him; the way his “dispatch” was executed; it must have been extremely humiliating for him and his family. Julia Gillard, the new Prime Minister, is an astute politician. She was however part of the “governing gang of four” of Rudd’s Labor government, which introduced ill-conceived schemes that failed, and some with deadly consequences. All they have done is replaced the driver with the co-driver, but we still have the same car. Whilst Labor may have changed their leader, their destructive policies remain the same. Julia Gillard was a part of the gross national mismanagement that has occurred under Labor to date. Both the new Prime Minister and the Deputy Prime Minister were on the inside making all the decisions and now they want Australians to believe that they are somehow different. Interesting read, about Julia Gillard, our new Prime Minister. Click here. 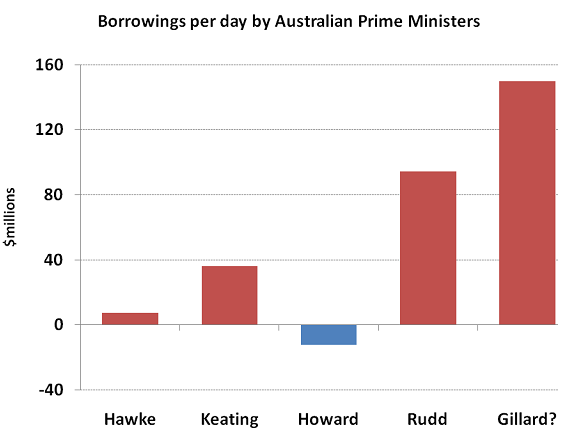 Rudd borrowed $95 million a day, Julia is set to break the record. Senator Barnaby Joyce said today that the new Labor Government has a lot of work to do to get this country back on track. Click on chart to enlarge. "The new appointee of the faceless factional bosses, Prime Minster Gillard, has already stated that she wants to get the Government "back on track", and it certainly is a long way off-track at the moment" said Senator Barnaby Joyce, Shadow Minister for Regional Development, Infrastructure and Water today. When this Government came to power Australia's gross debt was $59 billion. It is now $147 billion. This Government has spent $88 billion in 935 days. This is a new record for Australian Prime Ministers. "This Government has been an unmitigated disaster for our country, and even the Labor party now agrees. They have been racking up debt on the national credit card at $95 million a day. "Every day of the Rudd Government, that money could have built almost 500 km of sealed country roads or repaired and refurbished over 100 bridges in regional Australia. Instead, thanks to Julia Gillard and her team we have overpriced trinkets at the back of school yards. .
"If the new PM really wants to get this great country back on track, she needs to stop this reckless and wasteful spending. The budget that the Deputy Prime Minister handed down less than two months ago forecast borrowing of $150 million a day for the next financial year. Gillard is already on track to smash Rudd’s record and things look like getting worse before they get better." The government cannot give anything to anyone that they have not first taken away from someone else. Werner, you hit the nail on the head with: “All they have done is replaced the driver with the co-driver, but we still have the same car.” Is the Australian voter is so devoid of intellectual acuity and so stupid that they would vote this government back just because the prime minister is a women and a “pretty face?” If that is the case then they must have rocks in their collective heads, or have their heads in the sand and have learnt nothing from what has occurred in the term of the Rudd government of which Julia Gillard was the willing participant. Werner - there is no opposition as you know. Clearly both parties are but wings of the same bird and have been globally - since the voting system was installed to convince the peasants they/we had a choice in our future. Why else would nothing major have changed over the years no matter the party? The revenue raising pharmaco-medico-biowarfare machine rolls on endlessly. As planned. More opinions about the burka in Australia.